Membership to the guild is still open and dues are prorated to $12.50 for the rest of the year. We will be collecting dues for next year at the rate of $25 starting in February. Please make sure you are current on your dues to stay an active member of the guild. In the absence of the President, conduct Guild meetings and/or Executive Board meetings. Oversee the review of the Guild By-Laws as necessary. Keep minutes of the general meetings, or arrange for a substitute in his/her absence. Post the minutes of the general meeting on the Guild website. Keep minutes of the Executive Board meeting or arrange for a substitute in her absence. Provide the minutes of the Executive Board meeting to the President. e. Make a financial statement available for the members on an annual basis. Provide a quarterly financial statement to the Executive Board. 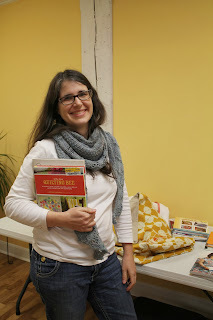 SewDown Nashville takes place in April, 2014. The tickets for the event sold out very quickly and Jessica, Ellen, Michelle, Teresa are going. 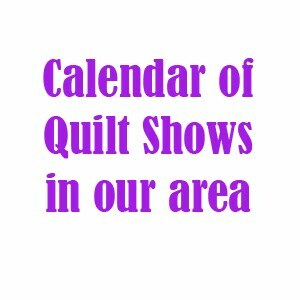 The quilt show at the Harvest Festival was great. Thank you to Cass and everyone else who helped set up the show. It was great to see people walking through and talking to people about our quilts and was a nice way to introduce modern quilting to the general public. The sale wasn’t that great, in terms of the number of things that were sold. Jessica heard that none of the vendors did that well. There is leftover merchandise that can be purchased by members at breaks at tonight’s meeting, as well as December's meeting. All money raised will still go to our guild as a fundraiser. Whatever is left over after the December meeting will be returned to the makers. The deadline for the Riley Blake Challenge has been extended to Feb. 17, 2014. Thirty of our members are taking part in the challenge. 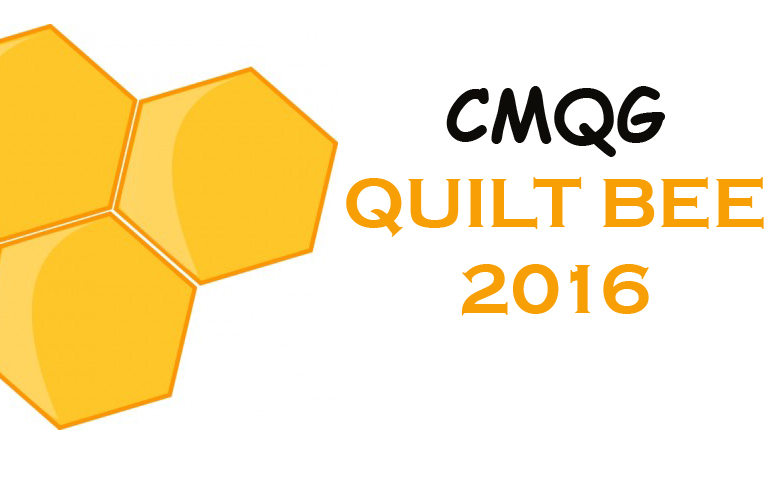 There are fabric prizes that RB is giving away, and details of them are on the Modern Quilt Guild website. Participants have to upload photos of project to the community RB challenge forum on the MQG site. Ten finalists will be chosen on Feb. 19, 2014, and the winners will be announced on Feb. 24. You can post photographs of your works in progress, and please use the hashtag #MQGRileyBlakeChallenge on social media. Gillian is collecting craft and quilting books and starting a guild library for us which will be a collection of resources that our members can check out and use. Gillian will keep a log of books and who checks them out. All current members can sign out books and keep them for a month. Gillian will send out a courtesy email reminder before the meeting when the book is due. Members can also loan books out for an extended period of time to add to the library. Please let Gillian know if you have anything you would like to donate to the library. Amy shared information about the Secret Santa swap and distributed the forms to those who want to participate. Please make a small item such as an ornament, bags, etc. to swap next month at our December meeting. Michelle passed around a sign up sheet for the holiday dinner next month. Jessica handed out our official MQG member cards during the break. If you did not receive yours, please let her know. Megan is from Arkansas and studied fine art in college. Her website is the Downtown Housewife and she just released her first book called "The Hand Embroidered Haven: 20 Home Sewing Projects with Hand Embroidery, Twilling, and Applique." Her style is urban/modern and some of her projects show how pre-made objects can be embellished with handwork. She also like to incorporate embroidery in quilts to give, handquilting with embroidery thread, etc, and she would like to become a fabric designer as well. Her book includes lots of embroidery stitches, basic quilting and sewing terms and it is available on her website at www.downtownhousewife.com. Her in-laws own the Sew Sweet Quilt Shop in Brunswick, MO. First up was the ugly fabric challenge! Cassandra made this in 1999. It has hearts and ugly fabrics that she got from a friend. She feels that it looks nice from far away with the braid design and color selection, but up close there are some ugly fabrics. Susan shared this African inspired quilt. Her son went to Ghana and she asked him to bring back fabrics. She thought the fabric he brought back was ugly, so she used it for the backing of her quilt. The front of the quilt has African women appliqued on it , made out of a waxed batik fabric that doesn’t go with anything in her house. Carol made a partridge in a pear tree pillow and used the fabric as a challenge to try different things. She also made a large floor pillow that was in a more modern design, but it has not been stuffed yet. Holly made this adorable pillow using a Moda bake shop pillow tutorial. Lynn shared her Do Good Stitches quilt from March. 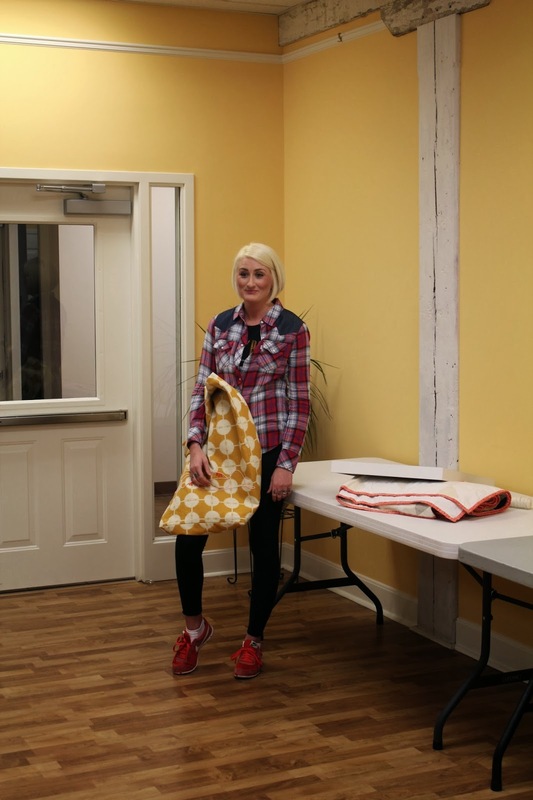 It was quilted by Jill and the blocks are Road to Tennessee blocks. She also shared her August Do Good Stitches quilt. This is the Gem Stone block from Freshly Pieced. Kayla shared an adorable dress she made for the Riley Blake challenge. 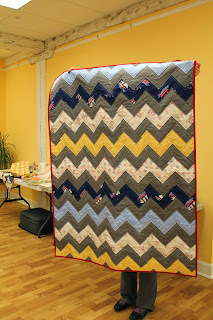 She also shared a chevron quilt that she made for her new baby. It was finished by Jill. And it has her son’s name on the back. SO cute! This member made a beautiful paper pieced quilt. The blocks are tiny log cabins and it was quilted by Jill. Gorgeous! 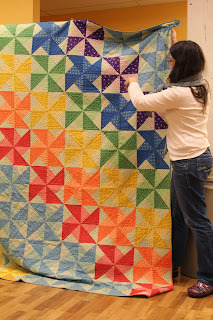 -Kay Larson shared a beautiful star quilt made in bright orange and green fabrics. And she also shared a baby quilt in orange and black and white, improvisationaly pieced, that isn't quite finished yet. Janie shared this great quilt. The large hexagons are made out of Heather Ross fabrics and embroidered bees. She added some hand embroidered details, using the design of the fabrics as inspiration. So sweet! Cassandra made a template for a flower that can be used for a hexagon quilt that she brought last month for her educational program. She is willing to lend the template out for this in our library. It works with Moda’s precut hexies. Amy T. shared an old quilt that she bought and wants to find out the name of the quilt block. Hopefully someone can help her! Michelle just got this great quilt back from Jill. Michelle didn't like it at first, but now thinks it's cute again now that Jill fixed it. It’s got tlittle houses and grass with lots of texture. All the houses have different quilting stitches and she’s really happy with out it turned out. She thinks that she will sew button on the houses for doorknobs. Michelle also shared this fun Christmas quilt, which was from a kit from Sewn. 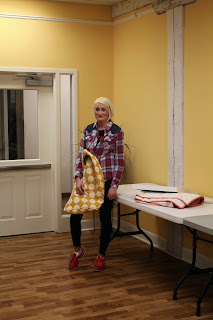 Teresa shared a beautiful fabric made out of Amy Butler Belle fabrics. The pattern is a disappearing 9-patch. Connie, Carrie, Ginny, Charlotte shared quilts that they made for the neonatel until at Good Sam Hospital. All of the quilts are made out of coordinating fabrics so they might be used for multiple births, etc. 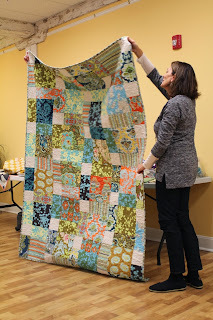 Janine shared the quilt she made for the Riley Blake Challenge . She challenged herself to use all the bits that she got, but she did add solids. The design is her own pattern and she used raw edge applique. Ruth shared her quilt for the Riley Blake Challenge. She appliqued them on black fabric with half circles. Jessica brought a shop sample that she made for Sewn. It's a large zig zag quilt and the pattern is by Tula Pink called field study. She also shared a quilt she made for a friend’s baby that is having their third baby. 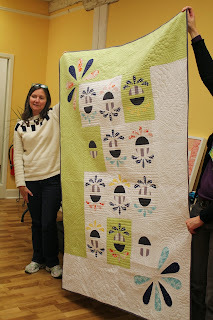 Gillian shared an adorable doll quilt made out of Denyse Schmidt's Chicopee fabrics. She also shared a quilt that her mom made for her when she was a child. The quilt is completely hand pieced and hand quilted. 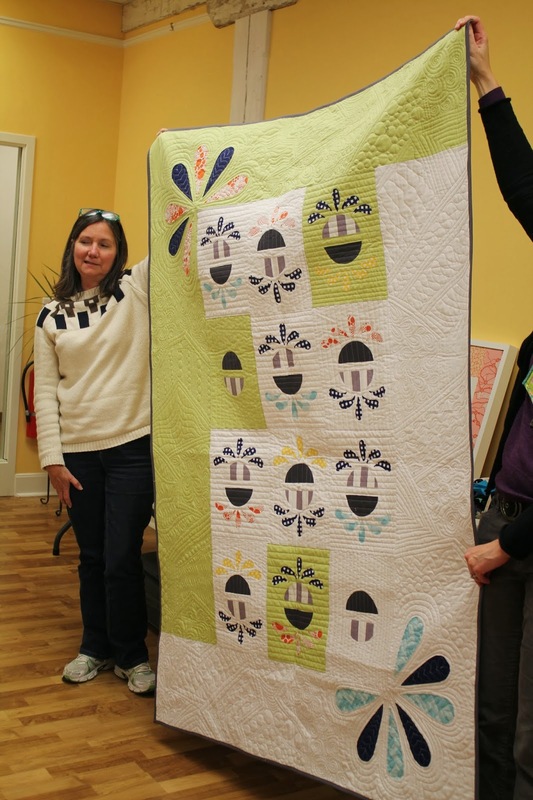 Her mother's quilt inspired this quilt that Gillian made for her daughter. She used Heather Ross's Briar Rose fabrics for the pinwheels and the binding is a vintage fabric. Please join us for our next meeting which is December 11, 2013 from 7:00-9:00 pm at the Centennial Barn.